This brief document features the small covered engine boiler flue storage rack I recently completed for my C&TT RR. 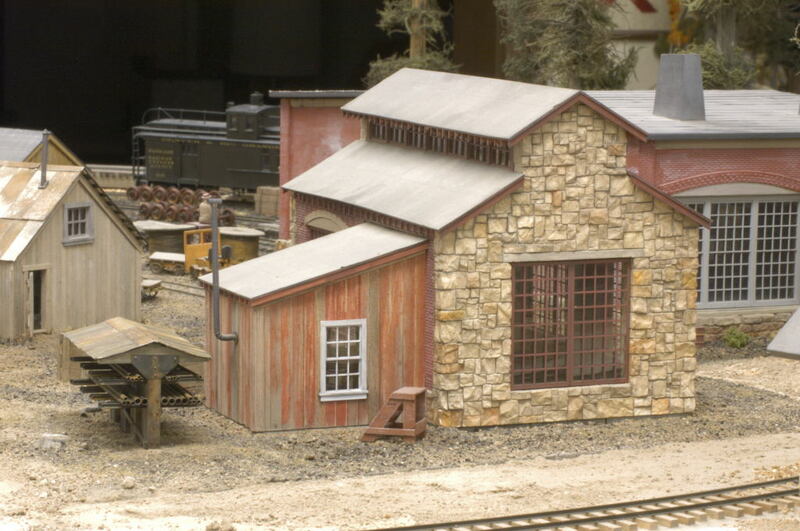 The inspiration for it came from David Steer's article in the October 2013 Railroad Model Craftsman magazine about the C&S Como Roundhouse Scene built by Grant Knowles. A four page article featuring the construction of my version of the rack was published in the June, 2014 issue of Railroad Model Craftsman magazine. I wish to thank the members of the Sn3 Yahoo forums who helped me by providing background reference information about the sizes of engine boiler flues and Mike McKenzie who created the 3-D drawing and colorful scale drawings for this project. The flue rack was made from laminated strip wood timber beams, short sections of code 70 weathered rail and corrugated metal for the roofing material. 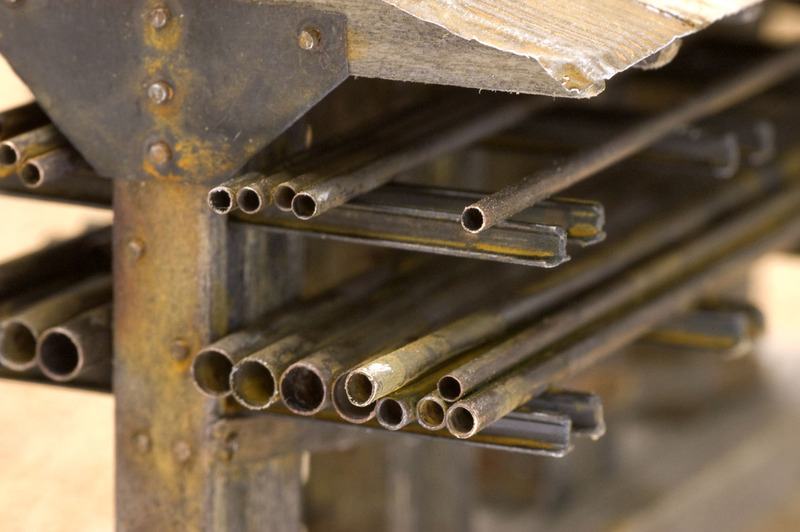 Scale 16’ lengths of 3/64”, 1/16” and 3/32” brass tubing were cut to represent boiler tubes. 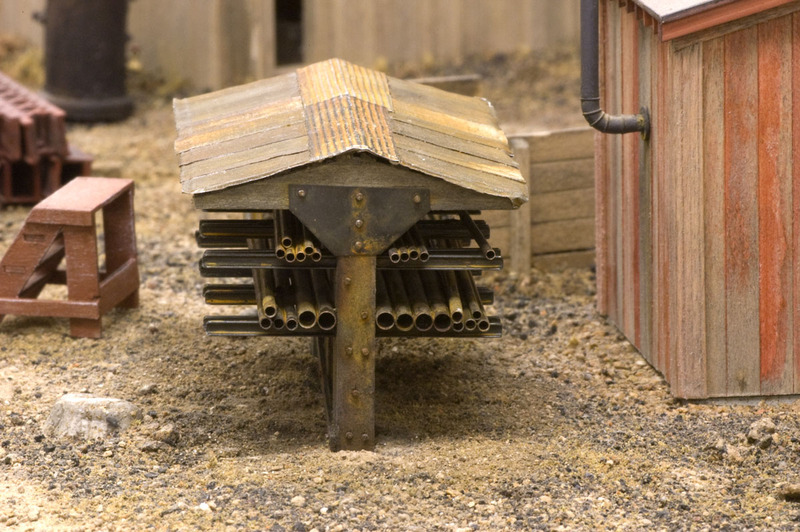 A 30 year old rusting solution made by disolving a steel wool pad in a bottle of white vinegar, was used to create the rust effect on the metal roofing. To make the structure easily removable, four holes were carved into the scenery with small carving chisels so that the four supporting posts could be inserted and removed whenever I needed to remove the structure to do additional scenicing work in the area. A metal gusset was fabricated out of brass shim stock and blackened with Gun Bluing Solution. Tiny holes for small brads were drilled through the gusset and five brads were pressed into place. The rusting solution was brushed onto this plate to creat the rust effect. The small brads were also used to suggest the bolts that secured the diagonal brace in place. They were also colored with the rust solution. Here's one view of the flue pipes on the rack. 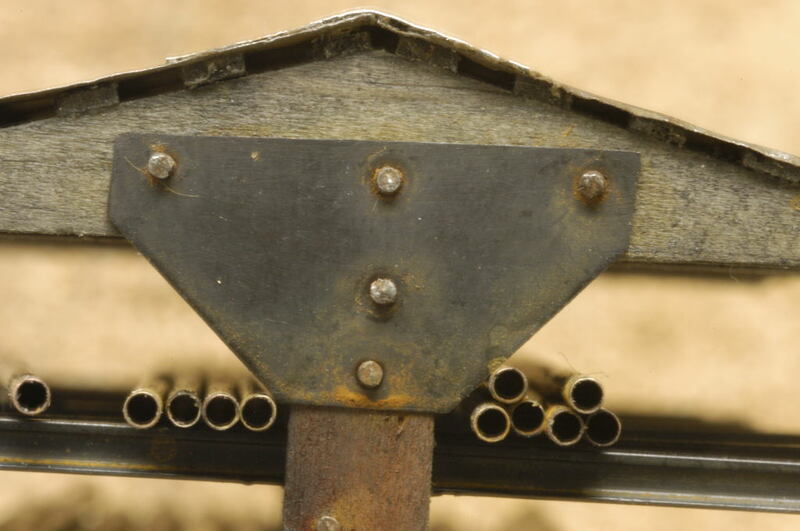 The larger diameter pieces were stored on the lower rails to make them easier to retrieve. Through the Internet searches and suggestions from modeling friends, I learned that both K-36 and K-37 engines had 2.25" flue tubes. Since 3/64" brass tubing represent 2.5", I decided that was close enough. This is the other side of the rack that's also holding an assortment of flue pipes. Since K-36 engines used 5.5" for their super heater piping it was represented using 3/32" tubing. To add additional variety to the rack I cut some 1/16" tubing to represents 4" tubing. The flue supports were made from 8' lengths of weathered code 70 rail. 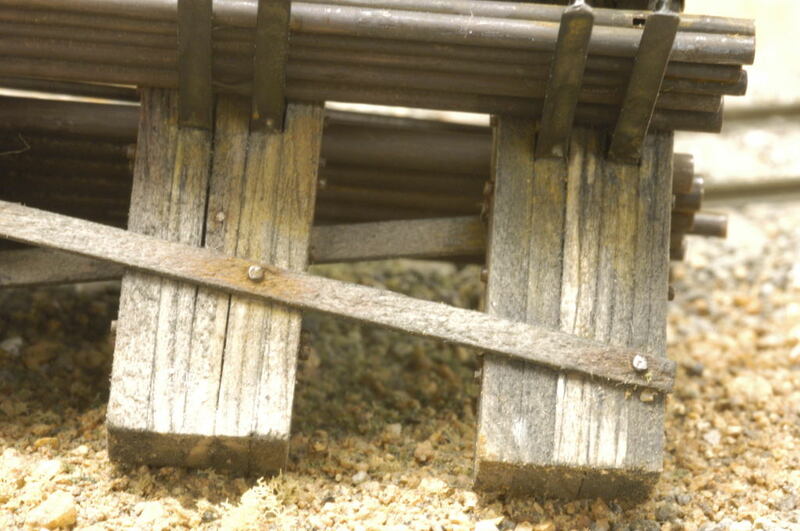 To prevent bloody events, the ends of the rails were rounded with a miniature file to remove any sharp edges. 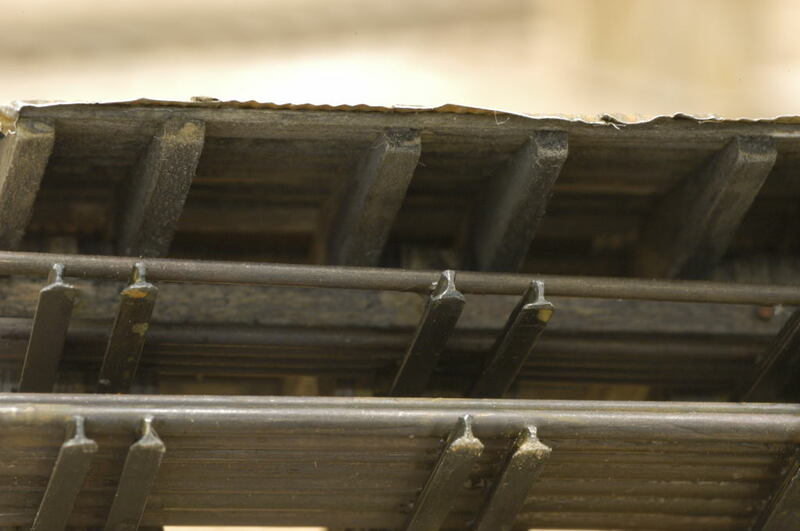 Evidence of the rust solution can be seen on the underside of the rails pieces. The brass tubing was cut to 16' lengths. 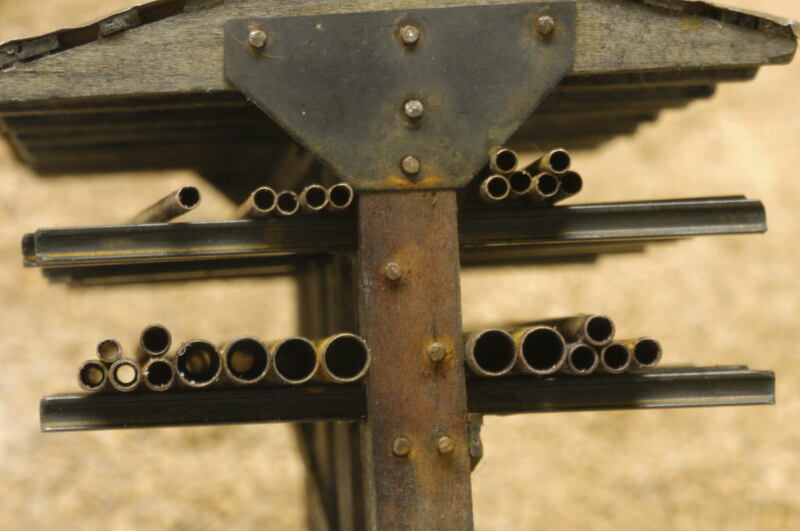 To create a thinner tube wall effect, each piece was chucked into a Sherline lathe and it's end was drilled out with a numbered drill that was about 4 number sizes smaller than the diameter of the tubing. 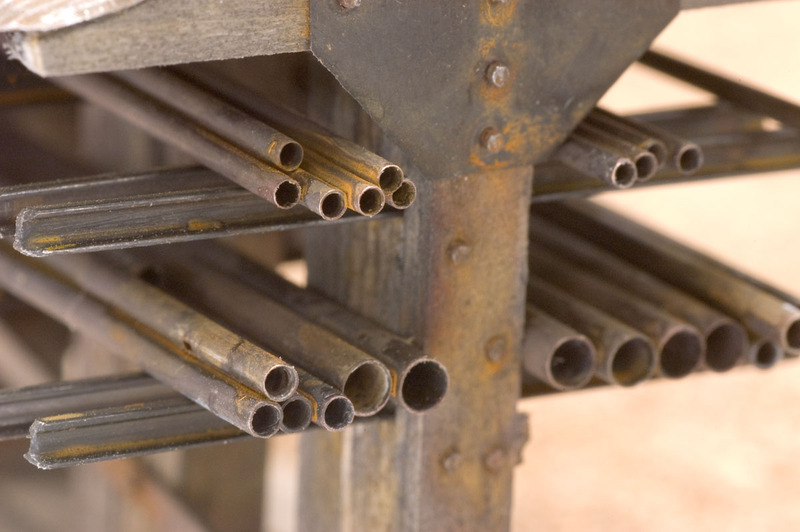 To complete the process all tubes were blackened with separate applications of Archer's Etchant and gun bluing solutions. 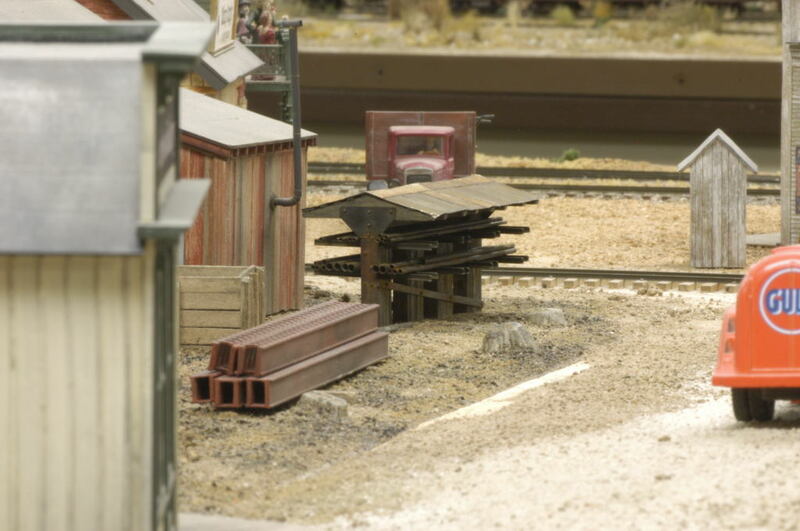 The dimunitive rack is located next to the car repair building, the blacksmith's shop and engine house. It's close to all the places where tubing and various pieces of metal stock could be stored. 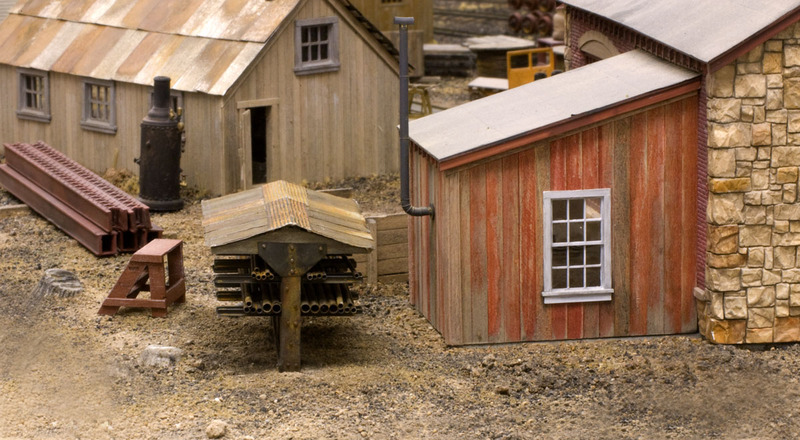 Because it's removable, it can be lifted out of the way when scenicing is done on the layout. Here's another view of the flue rack looking down the main street that runs through the community of Tall Timbers. While small in size, it does offer some protection to the flue tubes and other metal items from the elements. 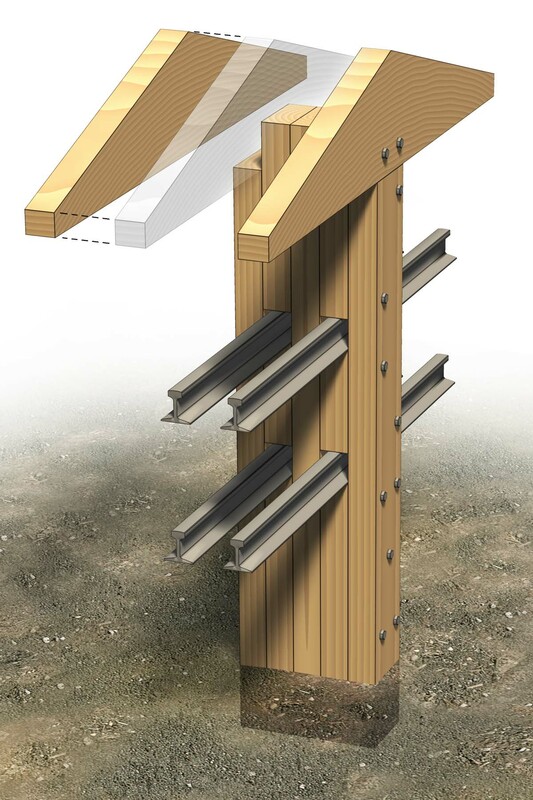 This 3-D drawing by G. M. (Mike) McKenzie illustrates how the four rack support posts are constructed. Four 8’ long pieces of railroad rail have been slipped through the openings in the posts, centered, then secured in place with CA adhesive. Note how the two roof formers were attached to notches designed into the outer timber pieces and that the post has been buried slightly in the scenery base. The gusset plates used on the two outer posts of the model are not shown for clarity sake. They would have gone where the roof formers and posts meet. 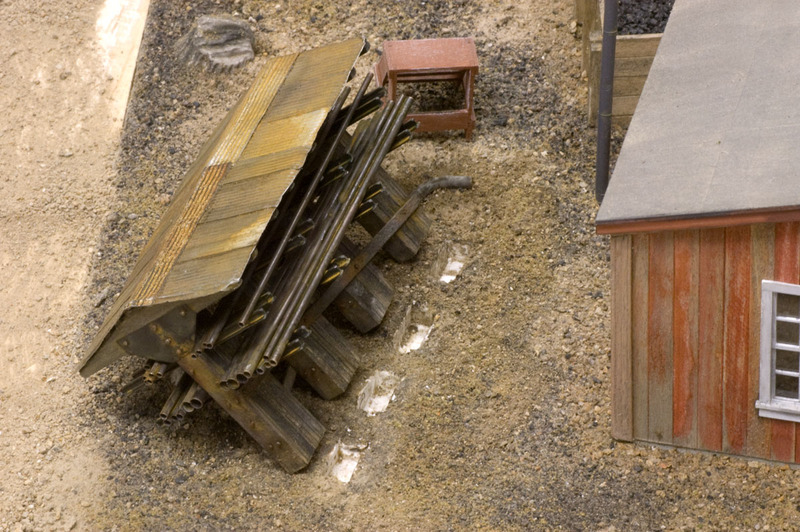 On this model, the posts are buried about 1' in the scenic base and it’s 8’ from the ground to the tip of the roof former. This side and end view drawing by Mike McKenzie was originally drawn in both O and S scale versions for the RMC article. If you wish to print out a copy for yourself, click on the link posted below. 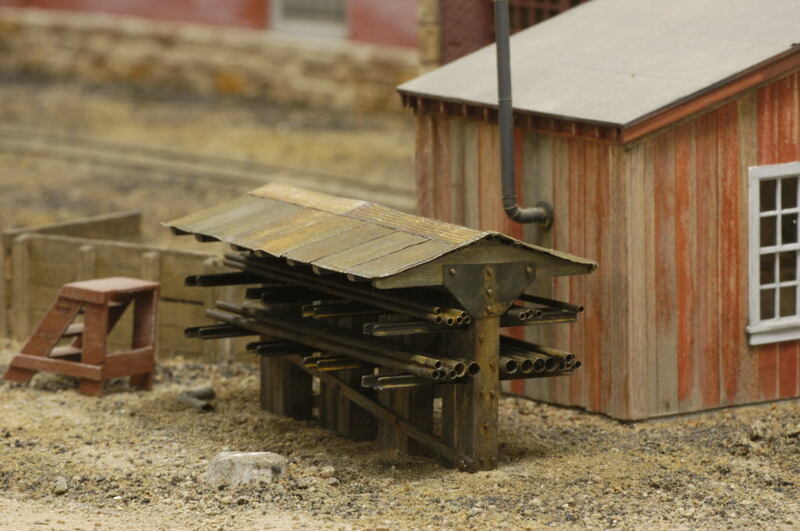 It includes both the S and O scale versions and has plenty of dimensions to help you to construct a rack for your own layout. Click this link "Boiler Flue Rack Scale Drawing" to download both an S and O scale drawing of the rack. Be sure to set your printer page settings to Landscape mode before printing.